The desire and purpose of EBF in missions is to glorify God by providing all peoples, both locally and globally, the opportunity to hear the gospel of Jesus Christ, to respond with faith in Him, and to live in obedience to Him. Emerald Bible Fellowship is currently focused on the proclamation of the gospel to the Khmer-speaking people of Cambodia. Our desire is to strengthen the church in the knowledge of ALL the Scriptures and how God's grand story is understood from beginning (Genesis) to the end (Revelation) with the Hero (Jesus) at the center of the story. We believe that this biblical theology will greatly benefit the Cambodian church. Check out www.khmergospel.org for more information on these projects. To attain this goal we have obtained the publishing rights to produce a co-edition of The Jesus Storybook Bible by author Sally Lloyd-Jones. This illustrated children's book tells the story revealed in the Scripture from the beginning to the end with Jesus at the center. It is beautifully made and wonderfully written. 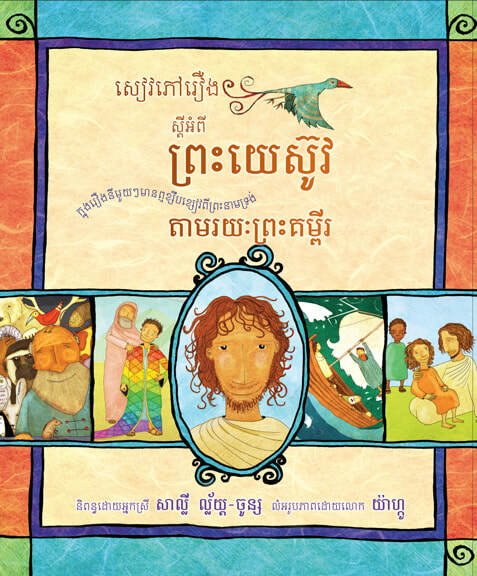 By partnering with brothers and sisters in the Cambodian Church here in the United States (Kakrona and Elizabeth Khem) and Action Cambodia (Nathan Wells) in Phnom Penh, we hope to produce an initial print run of 3,000 copies to be delivered to Cambodia and to Khmer-speaking believers in the United States. Our second project is to see the entire Scriptures, both Old and New Testaments, recorded in an audio format so that Khmer speaking people can hear the Word of God. We have completed the production of the Central Khmer Audio Bible, containing both Old and New Testaments, and are currently working to distribute the recording in ways which rural areas can use it. ​We desire to distribute the audio bibles free of charge through the Church in Cambodia. If you know of fellow Christians in Cambodia, or in communities of Khmer speaking people throughout the world, please contact EBF so that we can partner together to see the Word of God distributed in this format to our Khmer brothers and sisters who cannot read at this time. "To see the people of Cambodia transformed by the Gospel into communities of believers with the spiritual influence that reaches deep into their culture and disseminates across district, social, ethnic, and national boundaries." ​The Hogues' are Back in CambodiaThe Hogues returned safely back to Cambodia in early July 2016. The Hogues' MinistriesThe Hogues have returned to their ministry in Koh Kong. Jeff continues work on his dissertation, including interviews and visits to World Team church plants country-wide. They will also be investigating Cambodian migrant workers in Thailand to inform their decision, along with World Team, on a future ministry location. Their hope is to work with Cambodians living in Thailand. For Courtney's father Paul, who is nearing the end of his life. For Courtney and Weston, as they and other family members care for Paul; for Jeff and the girls as they remain in Cambodia. Pray against church attrition in Cambodia. For Jeff, as he prepares a discipleship intervention. For Weston, Emma and Dani as they interact with their unbelieving Cambodian friends. For the World Team Cambodia field conference in June. Pray for unity and interdependence. Mary Haag works with Overseas Missionary Fellowship and has been supported by EBF since 1989, when she first started missionary work in the Philippines. After a year of furlough, she has returned to Phnom Penh, Cambodia, where she serves in the needed area of social development. Please pray for her and send her a note of encouragement as she works hard to further the glory of God. "Counseling is intense discipleship. It provides the amazing opportunity of meeting people in their darkest moments and bringing God’s presence there. My ministry includes providing personal counseling to mostly Cambodians, as well as training and mentoring Cambodians in this ministry of counseling." Mary meets weekly with a select group of seven staff at this Christian-based hospital to train in counseling. In addition, she is intensively training one of them as the primary counselor. Along with the counseling class, Mary meets with Sochea for supervision to discuss clients, and they also sometimes see clients together. She is also currently meeting with some staff at MMC for personal counseling. Mary teaches a 3-credit class in basic counseling to 4th year bible school students. International Christian AssemblyMary has joined with two others to expand counseling services at the counseling office in the building at ICA. Jonathan Trotter shares Mary's heart for doing this ministry in the Khmer language for Cambodians. They are also joined by Moch Sovannara, who is a former student of Mary’s and who received an MA in counseling from Baylor University. That God has opened the way for me to continue my work in Cambodia. Thank God for opening the door for me to get EMDR training, for the provision of funds, for a place to stay throughout, and for the funds to cover future Skype consultation sessions. Thank God for all those who continue faithfully with me during this time of Home Assignment. That God will enable and bless each one of us in this task. That God will bring EMDR clients to me according to my competence at this point…and bless with healing! That God enable and provide a car that will be faithful and suitable for the roads in Cambodia, and in my budget. For Khmer ability and peace as I settle and readjust to life there. For the time to prepare for teaching at one bible school in July. My new computer has messed up my Khmer fonts. Pray for resolve! Also, for the renewed connections with students and places of ministry. currently reside in Phnom Penh Thmey. Choeun is currently studying at Phnom Penh Bible School, preparing for pastoral ministry. He has a heart for encouraging Cambodian pastors and church leaders in the areas of leadership and planning. Beth desires to provide a way for Cambodian farmers to make sustainable and sufficient livelihoods through access to better markets and organic certification; eventually, she and Choeun would like to establish a demonstration farm and training/meeting center for use in both aspects of their ministry. Choeun and Beth will both share the gospel and teach about giving back to God in a joyful and appropriate manner to enable His people to complete His work in their own communities and beyond! Organics 4 Develoment has had its first Board meeting! Choeun's new study schedule, which is helping him stay on track and improve his performance. Growth and success for Organics 4 Development. A good working relationship with The Cambodian Organic Agriculture Association (COrAA). Matai's adjustment to preschool and wisdom about whether or not he should continue there. Matai's health (he has been sick 9 times already this year). An affordable and dependable house helper who will be wonderful with Matai.